The A5's user interface and ergonomic design simplifies workflow. The 15” touch screen enables clinicians to easily select ventilation settings, so less time is spent maneuvering and more time is devoted to patient care. The A5's ample work surface, comfortable foot rest, central brake and integrated cable sweeps enhance device mobility. 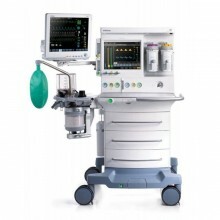 Click the button below to add the Mindray A5 Anesthesia Machine to your wish list.